Geoffrey of Monmouth (Latin: Galfridus Monemutensis, Galfridus Arturus, Welsh: Gruffudd ap Arthur, Sieffre o Fynwy) (c. 1100 – c. 1155) was a Welsh cleric and one of the major figures in the development of British historiography and the popularity of tales of King Arthur. Much of his work is considered to be pseudo-history. 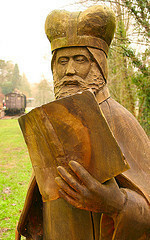 He is best known for his chronicle Historia Regum Britanniae (History of the Kings of Britain); his document of quotations attributed to Merlin, Prophetiae Merlini (Prophecies of Merlin); and his poem Vita Merlini (Life of Merlin).